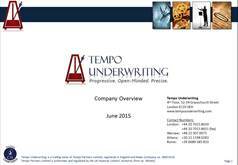 UK-based Tempo Underwriting announced that it has started underwriting Commercial D&O through a binding authority arrangement with W. R. Berkley Insurance (Europe), Limited, the European affiliate of W.R. Berkley. This entry was posted in Press Releases and tagged Insurance Journal. Bookmark the permalink.